Induced Chemical Defenses in Conifers: Biochemical and Molecular Approaches to Studying their Function (A. Schmidt et al.). Molecular Biochemistry and Genomics of Terpenoid Defenses in Conifers (D. Martin, J. Bohlmann). Some Insights into the Remarkable Metabolism of the Bark Beetle Midgut (C. Tittiger et al.). Interactions among Conifer Terpenoids and Bark Beetles across Multiple Levels of Scale: An Attempt to Understand Links between Population Patterns and Physiological Processes (K.F. Raffa et al.). Molecular Biology and Biochemistry of Induced Insect Defenses in Populus. C. (P. Constabel, I.T. Major). Tropical Forests as Sources of Natural Insecticides (M.B. Isman). High Molecular Weight Plant Polyphenols (Tannins): Prospective Functions (Takashi Yoshida et al.). Odor Perception and the Variability in Natural Odor Scenes (G.A. Wright, M.G.A. Thomson). Structure and Function of Insect Odorant and Pheromone-Binding Proteins (OBPs and PBPs) and Chemosensory-Specific Proteins (CSPs) (N.S. Honson et al.). Olfaction and Learning in Moths and Weevils Living on Angiosperm and Gymnosperm Hosts (H. Mustaparta, M. Stranden). The Phytochemical Society of North America held its forty-fourth annual meeting in Ottawa, Ontario, Canada from July 24-28, 2004. This year's meeting was hosted by the University of Ottawa and the Canadian Forest Service, Great Lakes Forestry Centre and was held jointly with the International Society of Chemical Ecology. 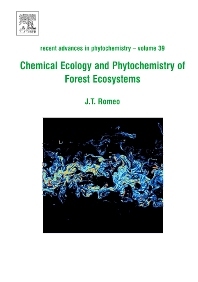 All of the chapters in this volume are based on papers presented in the symposium entitled "Chemical Ecology and Phytochemistry of Forest Ecosystems". The Symposium Committee, Mamdouh Abou-Zaid, John T. Arnason, Vincenzo deLuca, Constance Nozzolillo, and Bernard Philogene, assembled an international group of phytochemists and chemical ecologists working primarily in northern forest ecosystems. It was a unique interdisciplinary forum of scientists working on the cutting edge in their respective fields. While most of these scientists defy the traditional labels we are accustomed to, they brought to the symposium expertise in phytochemistry, insect biochemistry, molecular biology, genomics and proteomics, botany, entomology, microbiology, mathematics, and ecological modeling.